Ferdinand von Mannlicher (1848-1904) studied engineering at the Vienna Technical College and in 1869 began working for the Austro-Hungarian railroad industry. During his tenure with the Kaiser-Ferdinand-Nordbahngesellschaft (the Emperor Ferdinand Northern Railway Company) he traveled to the United States to attend the 1876 International Exhibition in Philadelphia, where his interest was piqued by exhibits about military weapons. Afterward, he studied as many patents related to weapons as he could locate in the patent office. 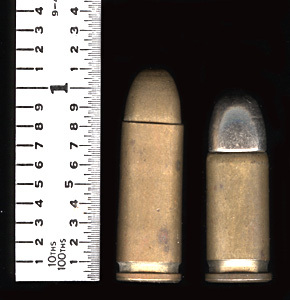 The 7.63mm Mannlicher cartridge (left) compared with the 7.65mm Browning (right). Safety on, blocking the hammer. Safety off, ready to fire. When he returned to Europe Mannlicher began to design a repeating carbine, and in 1885 invented the clip loading mechanism that was used for many repeating rifles and early automatic pistols. He retired from railroad work in 1887 and began to devote himself full time to designing repeating mechanisms for rifles and pistols. He became such a prolific small arms designer that he has been referred to as Austria’s John Browning. He was granted as many as 150 patents during his lifetime, and his designs have had a pervasive influence right up to the present day. Mannlicher designed several pistols prior to the 1900. His Model 1894 (Austrian patent number 44-2911 of 3 July 1894) was an unusual double- action blow-forward design, wherein the barrel moved forward as the bullet sped through the bore. The barrel would lock in the forward position until the the trigger was released, whereupon it would return and another cartridge would be chambered. Mannlicher patented an unlocked breech design in 1896 (Austrian patent number 47-1129 of 28 October 1896), but it was never manufactured and no prototype is known to exist. Also in 1896 he introduced a locked breech pistol with the magazine in front of the trigger guard (Austrian patents number 48-1174 of 20 February 1898 and 49-776 of 14 January 1899). Later still he produced a gun known as the M1897/03 or M1903 which had a removable magazine and was available as a pistol, a pistol with holster/shoulder stock, and as a carbine. Mannlicher’s M-1900 pistol is considered to be his classic handgun design success. He was granted Austrian patent number 48-5681 on 29 November 1897. It was patented in 1899, but was not introduced until 1900. A few hundred early guns were manufactured by Rheinische Metallwaaren und Maschinenfabrik (RM&M) in Germany. Some of these early guns had a safety lever on the left side above the grip plate. Some had no safety mechanism at all. The takedown was accomplished by removing a screw through the bow of the trigger guard from the right side of the gun, then removing the side cover. Later guns were made by the Oesterreichische Waffenfabriks Gesellschaft (later known simply as Steyr) in Steyr, Austria. 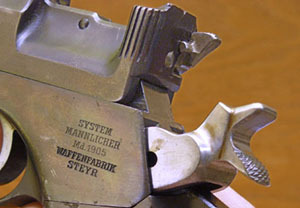 Some of the early Steyr production may have retained the takedown screw of the RM&M pistols. The gun was originally chambered for an 8mm rimmed cartridge; however, the 8mm cartridge was underpowered, and the gun was reintroduced in 1901 in a more powerful 7.63x21mm rimless cartridge, and hence is often known as the Model 1901, and occasionally as the Model 1900/1901; the final version being known as the Model 1905. No other weapon was ever chambered for the 7.63mm Mannlicher cartridge. In Germany the cartridge was known as the 7.65mm Mannlicher to distinguish it from the 7.63mm Mauser, and it is also referred to as the 7.65x21. The 7.63mm Mannlicher has a rimless straight case and an 86 grain bullet propelled by 3.2 grains of smokeless powder, producing a muzzle velocity of 1000 feet per second and 193 foot-pounds of energy. By way of comparison, a modern Sellier & Bellot 7.65mm Browning cartridge (.32 ACP) with a 73 grain bullet produces a muzzle velocity of 1043 fps and 177 ft-lbs of energy. Manufacture of the 7 .63mm Mannlicher mostly ceased after World War II, though the Argentine company Fabricaciones Militares San Lorenzo continued to make it until at least until 1958, and I cannot rule out the possibility that other manufacturers may have made occasional batches, and might still make them if there were sufficient demand. The M-1900 is a simple design, with a fixed barrel, the recoil spring just below it, and the first “open-top” slide ever made. This basic configuration was widely copied, notably by Beretta, Star, and Walther. 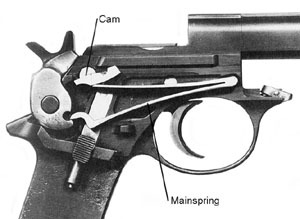 The lockwork of the Mannlicher is situated outside the frame on the left side, and the mainspring is situated outside the frame on the right side; both are covered by a wraparound cover held in place by a latch in front of the trigger guard. The M-1900 utilizes a delayed blowback mechanism. 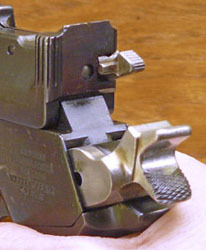 As the slide is blown to the rear by the force of the ignited cartridge, its rearward movement is delayed by a cam on the right side of the gun which fits into a notch on the underside of the slide and is tensioned by the upper arm of the mainspring. As the slide moves to the rear, the hammer is forced back and the mainspring is further compressed, putting additional tension on the cam. When the slide is pulled back to its rearmost position the cam also serves to lock the breech open for cleaning or loading. W.H.B. Smith doubted the effectiveness of the delay mechanism, but the pistol functioned quite reliably. The M-1900 has a non-removable 8-shot magazine in the grip which is loaded by stripper clip. The lockwork is described by R.K. Wilson as “particularly ingenious.” Wilson says: “The effect of this lock is to give a very sweet and crisp double pull. It is probably the pleasantest trigger mechanism of any self-loading pistol.” The safety is a simple mechanism which blocks the hammer from the firing pin. Only about 300 of the original M-1900 in 8mm were manufactured. About 12,000 total of the Models 1901-1905 were made. 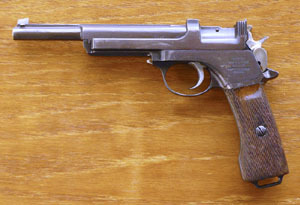 The gun was never adopted by the Austrian military, though it was often purchased privately, and the 1905 version, shown here, was adopted by the Argentine military. Due to its popularity in South America, a few near copies were made in Spain. There were several minor changes made during the brief lifetime of the gun, and variations are often found, particularly in barrel length. Serial numbers began with 1 in 1901, and started over again each year of production (1901, 1902, 1903, 1905). Most of the M1905 guns available today are Argentine military surplus and had the Argentine crest ground off the right side plate before they were sold. A few, however, retain the crest and these guns are prized by collectors. Copyright 2009-2013 by Ed Buffaloe. All rights reserved. Robert J. Adamek. Pistols of World War I. Pentagon Printing Corp., Pittsburgh, PA: 2001. Geoffrey Boothroyd. The Handgun. Bonanza, New York: 1970. Gordon Bruce. The Evolution of Military Automatic Pistols. Mowbray, Woonsocket, RI: 2012. Edward C. Ezell. Handguns of the World. Barnes & Noble, New York: 1981. Joseph J. Schroeder. “System Mannlicher.” Gun Collector’s Digest, 4th Edition, DBI Books, Northbrook, IL: 1985. Walter H.B. Smith. Mannlicher Rifles and Pistols. Military Services Publ. Co., Harrisburg, PA: 1947. Ian Hogg and John Weeks. Pistols of the World. Arms & Armour Press, London: 1978. R.K. Wilson. Textbook of Automatic Pistols. Arms & Armour Press, London: 1976. Special thanks to John Moss for telling me about the modern availability of 7.63mm Mannlicher cartridges.